So, the big ‘C’ word is not that far away now. Starbucks have revealed their red cup design to much controversy (seriously, some people will moan about ANYTHING!) and I’m starting to think about festive recipes. One of my favourite festive drinks is a good old eggnog latte, but a lot of eggnog you can get hold of in this country is really high in calories. So, I set out to see if I could make some myself that won’t break my diet. I’m pleased to tell you it worked! Doesn’t it look just so creamy and inviting?! Many of the recipes you’ll find online will contain full fat milk and more than likely double cream too! Delicious ingredients, but not ones I’ll eat every day when I’m trying to be good. My recipe uses skimmed milk, eggs, vanilla and a little nutmeg. That’s it! So tasty and yet positively angelic too. As I said, I love to turn this into a latte (and I’ll show you how I do it very soon!) but I also love to drink this just as it is. A delicious, milky drink with added protein from the eggs. Delicious. I used my Froothie Optimum 9400 high-speed blender to make this eggnog. It spins around so quickly that the friction from the blades will heat the milk, cooking the eggs in the process and making the eggnog lovely and frothy. If you don’t have a high-speed blender then you should definitely look at my link and think seriously about buying one of these wonderful machines. However, if that’s not an option then you can cook this eggnog in a pan stirring constantly until cooked through. To make this eggnog extra special and very adult, just add a slosh of your favourite booze. Personally, I love this with rum or amaretto but I’m sure lots of other alcohol will work too. You could also sweeten it with 1tbsp sugar or a drop of honey, agave etc; I don’t think it needs it but then I don’t have a particularly sweet tooth! 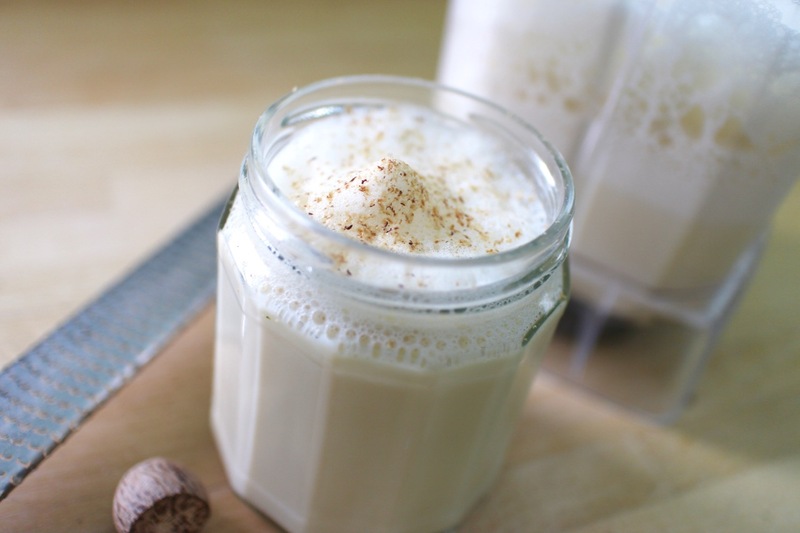 A lovely creamy eggnog, with all the flavour and much less of the calories. 1. Place all the ingredients into the Optimum 9400 and turn on to high. 2. Blend for around 5 minutes or until piping hot and slightly thickened. The milk froths up a large amount because of the low fat content and some of that froth may try to escape the top of the blender. If this happens, just switch off, wipe and resume blending. 3. Serve immediately or leave to cool and store in a sealed container in the fridge. Disclaimer: I am a Froothie ambassador because I think their products are awesome! This post contains affiliate links and a commission is earned if you buy using those links. I haven't had eggnog in absolutely years! I must remedy this omission from my life with your recipe! Yum!